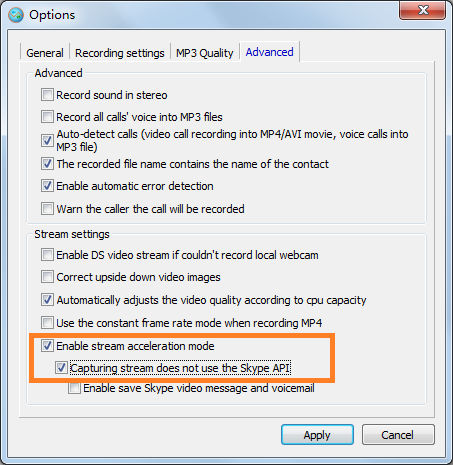 Evaer video & audio call recorder for Skype - Why there is not prompted after Evaer installation? The Evaer show "Waiting" in the screen. Why there is not prompted after Evaer installation? The Evaer show "Waiting" in the screen. If you use the Skype version 7.x , there have two solution to fix the issue. Solution 1 . Please enable the options as below image shows, then restart Evaer and Skype to have the issue fixed. Your IT Administrators has disabled the Skype Public API feature if your Skype not pop up the allow access message.Please follow below steps to fix it. 1), Click Start menu button. Now type regedit in the search box at the bottom of the Start menu and hit Enter key. 2), Click Yes button if prompted by UAC. 4), change the value to 0 or delete it if there is exist " DisableApi" value under the path. 5), restart your Skype and Evaer will fix the issue. 1), go to Start and select Run. 2),Type regedit in the window and click "OK". Why Skype says "Another application (evaer.exe) is attempting to access Skype,but we are unable to respond. Please try to restart the application."? Why I only hear the voice but no video when I playback the recorded MP4 file? Why Evaer does not show up in Skype API Control window? Why I got the message "WARNING: Cannot get normal audio data! " Why I got the message "WARNING: Cannot get normal video data! " How to turn on Windows hardware acceleration? Why Evaer record 3 files (local, remote webcam, mp3) if I set (in Option) video recording mode: "Local webcam only"
After recording a skype video call the evaer program shows i have recored 5 minutes video, but when open the video to play it only shows 4 seconds and the filesize is 300kb, why? how can i see full video? How to fix the remote video recorded up side down? I have ticked the box correct video upside down images (in addvanced) but still no work. When recording a Skype call, and listening to it. My voice that goes into Skype is located in the right speaker. The other sounds coming from other participants in Skype are locared in the left speaker. How to fix this? I might also add that I am using the trial right now. The Skype crashed when I try to record Skype video messag? Can Evaer call recorder for Skype continue to work after Skype removes the Desktop API in December 2013? I set up the software to record both sides. when i recorded a conversation, it recorded one side (the caller) and did not record my voice. How to change the Sample Rate in Windows 7,windows 8, windows 10 ? How to fix the video and audio out of sync issue? How to edit the recorded mp4 file using Camtasia, Adobe Premiere, Sony Vegas, Pinnacle or other video edit software? How to reduce the video channel flickering/position replacement? How to fix the "Could not record the microphone sound" issue on some computers?